This is a stunning 100 year old wine estate that was lovingly renovated in 2008 into a first class country house. This 12 acres estate includes a large villa with an oak barn to complete the rural picture. This is a luxury property brimming with Central European character. It is set in 14 acres of winding vines, still used to produce local white wines of regional repute. Entering through the double oak doors into the vast living area exposes the airy 60msq living room that remains of double height with a wooden staircase hugging its edge and leading to a minstrel’s gallery. The double panoramic doors lead out to a furnished south facing decking area of 25sqm straddling over the vine terraces below. Wooden balconies run around the first floor offering exquisite views. With a mixture of original features, antique furniture and modern technology, this comfortable home can easily accommodate 2 families. The closest neighbour is 500m away, the nearest supermarket 5 minutes drive away. Hisa Vina is a stunning country residence nestling in the wine-growing Haloze hills. It is the perfect location for either relaxing in the lap of semi-remote luxury or exploring the surrounding areas of natural beauty within Slovenia or its neighbours Austria, Croatia and Hungary. The rolling Haloze hills in the Pannonian region of Slovenia were first mentioned in the 15th century under the name of Chalas and Kalosen. The name is supposed to derive from the Latin word Colles meaning vine-growing hills, or from the old Slavic word “halonga” denoting a hilly world. The region is fringed by the rivers Dravinja and Drava and is popular with cyclists, hikers and fishermen alike. The ancient city of Ptuj (easily reached within 15 minutes drive from Hisa Vina) is an architectural chronicle at the crossroads of sunny Italy and the vastness of the Pannonian lowland, Alpine valleys and the expanse of the Balkans. It is the most picturesque town in Slovenia and boasts the richest heritage. The house benefits from fittings of the highest quality and carpentry to match the tradition and luxury of the property. The floors throughout the property are made of premier wood. The living and common areas boast antique oak tfloor o match the character of the house. The main doors and the doors into the cellar are heavy double oak doors. The wine cellars to the property have been lovingly restored and separated into 2 chambers. The first and largest has a newly tiled floor but the arched ceilings and wall recesses remain. Amongst other facilities housed here are 2 travel cots, a high chair and child gates for tenants with small children. A hammock and 2 adult and 2 chlldrens bicycles are available for the use of all tenants. The second cellar acts as a large utility and laundry room with washing machine, tumble dryer, sink and ironing facilities. The property includes 12 acres of lawn, gardens, vineyards, and forest. The 3 main bedrooms are furnished with antique pieces. Each has their own individual character. All have antique crystal chandeliers and wooden window shutters in the original local design. The accompanying antique furniture and wall coverings in each of the bedrooms have been tastefully chosen with stunning effect. The master suite is on the ground floor. It has an original clay stove shared with the main bathroom. Its 2 large windows overlook the front courtyard. The other 2 main bedrooms are on the first floor. They are suites in the truest sense with ante rooms off which lie the bedroom in one direction and private bathroom in the other. In addition to the 2 windows in each room there are doors leading onto the balconies from which the breathtaking views on both sides of the villa look out over the valley, vineyards and neighbouring hills. The 4th bedroom sleeps 3 people and is furnished with adult sized wooden bunk beds and a full sized brass day bed. Also availalbe: 2 cots. There are number of good restaurants in the locality. A comprehensive list of recommended restaurants (localy as well as across Slovenia) together with contact details is available at the property. Ptujska Klet – a local wine cellar - is one of the oldest wine cellars in central Europe. It has an impressive selection of wines and is open for wine tasting on pre-booking only. The nearest shop/mini supermarket is in Podlehnik, 5 minutes drive in the valley. The nearest cash point is in Podlehnik at the local supermarket or Petrol station. Large international supermarkets, pharmacy, bank, and doctors are found in Ptuj. Amongst the supermarkets I recommend Interspar in Qlandia in Ptuj for its range. Ptuj is the oldest city in Slovenia and was first recorded as a Roman settlement. This small and picturesque town is only 10 minutes drive away, handy for sightseeng as well as shooping. Ptuj castle located on the hill in the middle of the town is now a museum, exhibiting a variety of local antique artifacts: painings, pictures, masks, furniture instruments, wepons and armor. Visit is highly recommended. Graz, ex. European Capital of Culture is one of the most beatiful towns in Austria. A day trip to Graz can be as much about shoping as dining, or culture. A must see! Once on the way, look at the tourist guide for Osteria available in the house and consider visiting agro-tourist farms for some fine local cusine. Ljubljana, Slovenias capital, is a small and picturesque town. A day-trip to the capital makes a delightful destination offering shopping, art galleries, and a variety of bars and restaurants along the Ljubljanica River, which offer the chance to relax and “people watch” to while away the day and night. Most are open from morning until late into the evening. Each Sunday morning there is a street market in the centre. You can enjoy simply wandering through the stalls along the riverbank or if you have an eye for a bargain there are original paintings, antiques, bric-a-brac and jewellery on offer. Most of the stall holders speak adequate English. Don’t forget to haggle! There are a number of spas/outdoor swimming pools in Slovenia. The nearest is Terme Ptuj (15min drive), which boasts the tallest water slides in Slovenia. It is a great place for children and adults alike. Details of many other spas are given in the tourists guides provided in Hisa Vina. Slovenia is well known for its beautiful mountains and endless treking routes. Those who like dramatic Alpine senery could venture to Pohorje, Savinjska dolina, or the Kamniske Alps. Even more dramatic are the Julian Alps and the valley of Trenta in the north west of Slovenia. Those who preffer gentler rolling hills and wine-growing areas can explore the immediate surroundings of Haloze hills. See the guides and maps provided in Hisa Vina for specific details. A list of recommended local restaurants is available on request. In the winter season, the guests can enjoy skiing at a number of local ski resorts. A car is required to reach the resorts. The nearest ski resort is Pohorje ski area (15 min drive), a host to womens World Cup races. The Pohorje resorts of Areh and Bolfenk have a variety of pistes for both beginners and accomplished skiers. Other ski resorts in the area are Rogla (55 min drive), Golte (1 hour 10 min drive) and Sljeme in Croatia (1 hour 30 min drive). A guide to all local ski resorts is available in Hisa Vina. There is an 18-hole golf course in Ptuj, located 10 min drive from the house. Ptuj golf course (www.golf-ptuj.com) is regarded as one of the best in the region and was voted the best golf course in Slovenia in 2007. There are a further 4 golf courses within a 60 min drive. 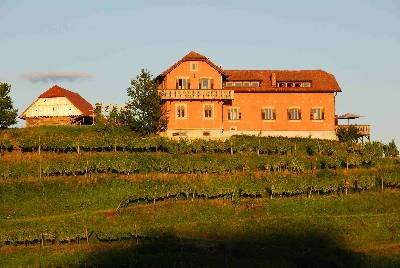 The second nearest is located in the vineyards of Slovenske Konjice - Zlati Gric (40 min drive). Others are in Moravske Toplice, Podcetrtek - Olimje, and Rogaska - Jelsingrad. Further details about all the golf courses in the region are available in Hisa Vina. Horse riding is available in the village of Videm – Športno Društvo Videm. For details see the local leaflets and guides available in the house. Slovenia is a great place for hiking and mountaineering. There are a number of hiking and cycling trails available in Slovenia. I suggest that you have a look at the page first and see if any of these are of interest. I have been hiking in the Julian Alps on the trails between the rivers Sava and Soca and would certainly recommend them. There are a few hiking and mountaineering guides and maps at the house for your convenience. Local hiking tours in Haloze, Pohorje, Donacka Gora, Ptujska are detailed in the guides available in the house. There are a number of health spas and outdoor water parks in Slovenia. Terme Ptuj is only 15 minutes drive from the house and will make for a great afternoon with the kids. Terme Ptuj boast the largest and fastest slides in Slovenia. I recommend a trip to Slovenske Gorice in the area of Ormož east of Ptuj (see Atlas Slovenije available in the house for directions). There are many local vineyards at which to pause and sample the local fare. Simply follow the signs in the area marked with a bunch of grapes and the words “Vinska Cesta“ meaning wine road. A good restaurant in the area is Taverna (look for a wooden sign “Taverna” approx 5-10min drive from Ormož towards Ljutomer. The sign will direct you right, up to a picturesque and hilly wine growing area called Jeruzalem. The views from the restaurant are stunning and make the trip a highlight. Please follow the weather reports. In the case of cloudy/foggy weather the east of the country you may catch the sun at the coast and in the Karst (Kras) area and Vipava/Gorizia or Goriška Brda (the most famous wine growing area of Slovenia). You can do great cycling trips in Slovenia. Pohorje hills above Maribor offer a number of cycling/mountain biking routes as well as bike rental shops. For further local routes please see the cycling map available in the house. Fishing in nearby river Dravinja and Lakes is possible. There are many more fishing areas in Slovenia. On the majority of Slovenian/Alpine Rivers only fly-fishing is possible. In Drava and Ptuj Lake coarse fishing is possible. Please note that a very detailed Atlas of Slovenia is available in the property for you to be able to find your way around. Feel free to make the use of specialist hiking and mountaineering maps and guides available in the house. BATHROOMS * Bathroom 1 - Bath with Shower, * Bathroom 2 - Toilet,Shower Enclosure,Bidet, * Bathroom 3 - Toilet,Shower Enclosure, * Bathroom 4 - Toilet,Separate toilet, The main bathroom is on the ground floor. It connects to the master bedroom and is layed with Italian stone tiles and mosaics. The sunken white corner bath is spacious with an antique-style shower unit attached. Next door is a self-contained lavatory and sink continuing in the same style and utilising the same tiles. The 2 further bathrooms on the first floor lie within the 2 bedroom suites. They each comprise large walk-in showers set behind glass walls and surrounded on both floor and walls by Italian tiles.